The Challenge: Figure out a way to add some color to your day in a new, unusual, or wacky way. I am happy to report that we have had some very sunny days here in Madison recently. So, I had that in my favor today as I filled 8 glasses (2 wine glasses) with colorful water. I lined them up along my window seal by my desk. I had a very colorful desk, with the sun shining through the many colors. I really enjoyed looking at the light and different reflections throughout the day as the light and colors moved to different parts of my desk. 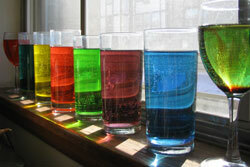 Dropping the food coloring into the glasses brought back some great memories of dyeing Easter eggs, making play-do and most recently teaching our “Color” unit in Kindergarten (the kids would ‘experiment’ with color mixing using eye droppers and colored water.) I really don’t want to put the glasses away. Dr. Seuss would be so proud. This morning I took great joy in eating some GREEN eggs. 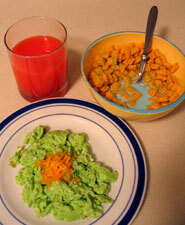 Sadly, I did not have ham — or spray paint — but I expanded my breakfast rainbow by eating Capn’ Crunch in BLUE milk and washing it all down with some RED orange juice. I cannot even begin to explain the sensation of giddy joy that I felt when I saw my eggs turn green. With God as my witness, food coloring is the best toy EVER. Today I went towards the edge of “wacky” in bringing more color into my life. I decided to wear my colors – all ROYGBV of them! Yellow long sleeve shirt, red 3/4 sleeve jersey, orange short sleeve t-shirt, dark blue jeans and striped socks – purple, yellow, green, orange and red! Lots of fun and quite a few smiles throughout my day so far! And I’ve decided I need more fun colored socks!! I wish I would have read this one before I went to work, but regardless, I came home & put 4 colored head bands on my head & several colored rubber bands in my hair, as well as royal blue running pants, light blue long sleeve shirt, red socks, grey sweatshirt w/ (green, yellow), and polar bear flannel pants. It was kinda fun! What’s the big deal about color? The first thing that our business consultant did at Maze Lumber about 2 years was change our company shirt color from a sleeply pastel business blue to the brightest yellow you could imagine! Now when our customers come into our lumberyard they think they have walked into a flock of cannaries of all different sizes including one with suspenders. Today I decided to decorate our office with really neat ads for Maze Nails our sister company. A while back I attended their national sales convention at Starved Rock and they gave us ad slicks with various animals and catchly quotes and rather than leave them in a folder I decided to post them for all to enjoy. One example is a cow with milk on it’s lips asking: Got Maze? We took this opportunity of color adding to wear two of the finest candy necklaces all day long. Katie wore hers as a traditional necklace, while Doug wore his like a hip biker chain hanging from his belt. We looked awesome and colorful. Hopefully we brightened someone’s day. I had blue milk like Jason and Beru. I just finished crocheting a hat from colorful orange and hot pink yarn and put it on. It instantly made me feel happy.